Florida transfer Treon Harris gets his first start for Big Blue. 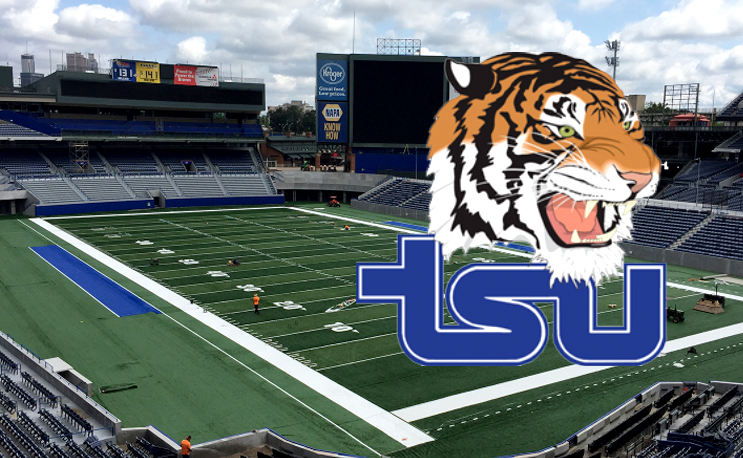 Win or lose, Tennessee State will make history on Thursday night as they become the first opponent to play football in the newly renovated Georgia State Stadium, the former home of the Atlanta Braves. Georgia State will welcome the Tigers back to Atlanta for the first time since 2010 when they beat Florida A&M. This will be the first meeting between the two schools as well as our first chance to get a look at Florida quarterback transfer, Treon Harris. He will be a redshirt-junior for the Tigers after starting 15 of 21 games for the Gators. Harris threw for nearly 2,700 yards and 18 touchdowns during his two years in the SEC. Harris will have the top weapon in the Ohio Valley Conference in senior wide receiver Patrick Smith. The preseason player of the year in the OVC and HBCU Gameday All American had 61 receptions for 966 yards and 13 touchdowns in 2016. Sophomore Steven Newbold is a dangerous receiver as well, hauling in 41 catches for 784 yards last season. Georgia State has only been playing football since 2010 and this is the first meeting between the two schools. Head Coach Shawn Elliot is in his first year at GSU after leaving his co-offensive coordinator position at South Carolina a year ago. Georgia State was 3-9 last year playing out of the Sun Belt Conference, but they do return Conner Manning, the league’s top quarterback. Manning threw for 2,684 yards last season with 16 touchdowns versus 13 interceptions. GSU is an FBS team and Tennessee State hasn’t had any luck in that department. They are 0-3 versus FBS teams. Both teams did share a common opponent last year in UT Martin. Tennessee State defeated them 34-30, while Georgia State won 31-6. UT Martin is also a member of the OVC and finished with a respectable 7-5 record in 2016. Coach Rod Reed will have his hands full with an FBS opponent on opening day but he’s not too shabby when it comes to season openers. He is 6-1 in season openers, but it should also be noted that TSU hasn’t opened on the road since 2008. The Big Blue has a nice fan base in Atlanta and the reconfigured Georgia State Stadium has a fair amount of space for them with a seating capacity of 23,000. This could be a magical year with plenty to cheer for with the potential of Harris at QB and Smith out on the edge. Kickoff is set for 7 pm, follow HBCU Gameday for updates on social media and a full recap of the game. Correction: A previous version of this article stated that Tennessee State’s last appearance in Atlanta was 2009, it was 2010. The last time TSU played in Atlanta was in the 2010 Atlanta Football Classic against FAMU, and TSU won. TSU beat Louisville in 1979 & 1978.